Attention all aspiring cadets and cadettes in South Cotabato, General Santos City, Sarangani and the whole of SOCCSKSARGEN! 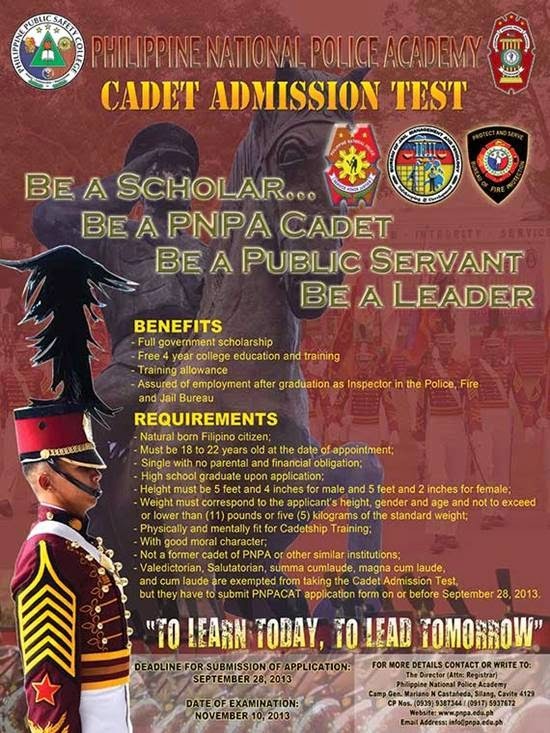 The Philippine National Police Academy (PNPA) is once again looking for able, responsible and well-motivated Filipino youths who have the aptitude for service to take the 2013 PNPA Cadet Admission Test (PNPACAT) set on November 10, 2013. In Region 12, the PNPACAT testing center will be at Notre Dame of Dadiangas University in General Santos City. Deadline for submission of application for the 2013 PNPACAT will be on September 28, 2013. Successful PNPA applicants will be entitled to a full government scholarship with monthly basic pay of P24,000 and other training allowances and upon graduation will be guaranteed of employment as Inspectors (liutenants) in the Philippine National Police, Bureau of Fire Protection or in the Bureau of Jail Management and Penology.